An asterisk (*) marks the crabs included in the clade Thoracotremata. Crabs are decapod crustaceans of the Brachyura infraorder or division. As members of the order Decapoda, which also includes crayfish, lobsters, prawns, and shrimp, crabs have ten legs: the last five pairs of the eight pairs of thoracic appendages characteristic of crustaceans. As members of the Brachyura taxon, crabs typically have a very short "tail" or the abdomen is entirely hidden under the thorax ((Greek: brachy = short, ura = tail). Crabs typically are characterized by the first pair of the five pairs of appendages being modified into chelae (claws), a thick exoskeleton, and an upper body shield or carapace that is generally broad, hard, and flattened. Crabs offer important benefits to human beings. Economically and nutritionally, crabs are a popular food item. Ecologically, they are integral to food webs, both as a consumer of animals and plants, and as a popular prey for many birds, fish, and mammals. They also provide aesthetic benefit to humans, whether for the joy experienced from the wonder of observing their diverse forms and colors, or whether they appeal to other senses via their texture and taste as a food item. There are about 4,500 known species of crabs. Crabs are found in all of the world's oceans; there are also many freshwater and terrestrial crabs, particularly in tropical regions. About 850 species of crab are freshwater or semi-terrestrial species (Sternberg and Cumberlidge 2001). Crabs vary in size from the pea crab, only .25 inches wide, to the Japanese spider crab, with a leg span of 8 to 9 feet (Mann). Some animals that bear the name "crab" are not true crabs. The horseshoe crab, which also is called by the name king crab, is not a crustacean, and the hermit crab, although a crustacean, is not a true crab. True crabs have five pairs of legs, the first of which is modified into a pair of claws and is not used for locomotion. In all but a few crabs (for example, Raninoida), the abdomen is folded under the cephalothorax. The mouthparts of crabs are covered by flattened maxillipeds, and the front of the carapace does not form a long rostrum (Dixon et al. 2004). The gills of crabs are formed of flattened plates ("phyllobranchiate"), resembling those of shrimp, but of a different structure (Taylor and Taylor 1992). Most crabs show clear sexual dimorphism and so can be easily sexed. The abdomen, which is held recurved under the thorax, is narrow and pencil-like in males. In females, however, the abdomen retains a greater number of pleopods (swimming legs, but also used for brooding the eggs) and is considerably wider. This relates to the carrying of the fertilized eggs by the female crabs (as seen in all pleocyemates). In those species in which no such dimorphism is found, the position of the gonopores must be used instead. In females, these are on the third pereiopod (primarily walking legs and are also used for gathering food), or nearby on the sternum in higher crabs. In males, the gonopores are at the base of the fifth pereiopods or, in higher crabs, on the sternum nearby. Crabs are omnivores, consuming both animal protein and plants. They feed primarily on algae but take any other food, including mollusks, worms, other crustaceans, fungi, bacteria and detritus, depending on their availability and the crab species (Woods 1993). For many crabs, a mixed diet of plant and animal matter results in the fastest growth and greatest fitness (Kennish 1996; Buck et al. 2003). Crabs make up 20 percent of all marine crustaceans caught and farmed worldwide, with over 1 ½ million tons being consumed annually. Of that total, one species accounts for one-fifth: Portunus trituberculatus. 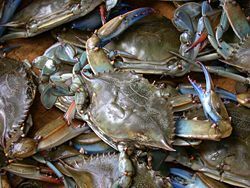 Other important taxa include Portunus pelagicus, several species in the genus Chionoecetes, the blue crab (Callinectes sapidus), Charybdis spp., Cancer pagurus, the Dungeness crab (Cancer magister), and Scylla serrata, each of which provides more than 20,000 tons annually (FAO 2004). The earliest unambiguous crab fossils date from the Jurassic, although the Carboniferous Imocaris, known only from its carapace, is thought to be a primitive crab (Schram and Mapes 1984). The radiation of crabs in the Cretaceous and afterwards may be linked either to the breakup of Gondwana or to the concurrent radiation of bony fish, the main predators of crabs (Wägele 1989). About 850 species of freshwater or semi-terrestrial species are found throughout the world's tropical and semi-tropical regions (Sternberg and Cumberlidge 2001). They were previously thought to be a closely related group, but are now believed to represent at least two distinct lineages, one in the Old World and one in the New World (Sternberg, Cumberlidge, and Rodriguez 1999). The infraclass Brachyura contains about 70 families, as many as the remainder of Decapoda (Martin and Davis 2001). The evolution of crabs is characterized by an increasing robustness of the body, and a reduction in the abdomen. Although other groups have also undergone similar processes of carcinization, it is most advanced in crabs. The telson is no longer functional in crabs, and the uropods are absent, possibly having evolved into small devices for holding the reduced abdomen tight against the sternum (Guinot and Bouchard 1998). In most decapods, the gonopores (sexual openings) are found on the legs. However, since crabs use the first two pairs of pleopods (abdominal appendages) for sperm transfer, this arrangement is different in crabs. The male abdomen has a narrower shape, and the gonopores are more toward the midline, away from the legs, and onto the sternum (De Saint Laurent 1980). A similar change is seen with the female gonopores. The movement of the female gonopore to the sternum defines the clade Eubrachyura, and the later change in the position of the male gonopore defines the Thoracotremata. It is still a subject of debate whether those crabs where the female, but not male, gonopores are situated on the sternum form a monophyletic group (Martin and Davis 2001). Several other groups of animals are either called crabs or have the term "crab" in their names. These include hermit crabs, porcelain crabs, and king crabs, which, despite superficial similarities to true crabs, belong to the infraorder Anomura. Other animals, such as horseshoe crabs are much more distantly related. Anomuran "crabs" can be distinguished from true crabs by counting the legs. In Anomura, the last pair of pereiopods (walking legs) is hidden inside the carapace, so only four pairs are visible (counting the claws), whereas uninjured true crabs generally have five visible pairs (in the family Hexapodidae, the last pair of pereiopods is vestigial) (Guinot 2006). Buck, T. L., G. A. Breed, S. C. Pennings, M. E. Chase, M. Zimmer, and T. H. Carefoot. 2003. Diet choice in an omnivorous salt-marsh crab: different food types, body size, and habitat complexity. Journal of Experimental Marine Biology and Ecology 292(1): 103–116. Retrieved November 28, 2016. De Saint Laurent, M. 1980. Sur la classification et la phylogénie des Crustacés Décapodes Brachyoures. II. Heterotremata et Thoracotremata Guinto, 1977. C. R. Acad. Sc. Paris 290: 1317–1320. Dixon, C. J., F. R. Schram, and S. T. Ahyong. 2004. A new hypothesis of decapod phylogeny. Crustaceana 76(8): 935–975. Food and Agriculture Organization (FAO). 2005. Global Capture Production 1950–2004. Retrieved November 28, 2016. Guinot, D. 2006. Rediscovery of the holotype of Paeduma cylindraceum (Bell, 1859) and description of a new genus of Hexapodidae (Decapoda, Brachyura). Zoosystema 28(2): 553–571. Guinot, D., and J. M. Bouchard. 1998. Evolution of the abdominal holding systems of brachyuran crabs (Crustacea, Decapoda, Brachyura). Zoosystema 20(4): 613–694. Kennish, R. 1996. Diet composition influences the fitness of the herbivorous crab Grapsus albolineatus. Oecologia 105(1): 22–29. Mann, Gregory R. n.d. Marine Animal Records Retrieved November 28, 2016. Schram, F. R., and R. Mapes. 1984. Imocaris tuberculata, n. gen., n. sp. (Crustacea: Decapoda) fror the upper Mississippian Imo Formation, Arkansas. Transactions of the San Diego Society of Natural History 20(11): 165–168. Sternberg, R. von, and N. Cumberlidge. 2001. On the heterotreme-thoracotreme distinction in the Eubrachyura De Saint Laurent, 1980 (Decapoda: Brachyura). Crustaceana 74: 321–338. Sternberg, R. von, N. Cumberlidge, and G. Rodriguez. 1999. On the marine sister groups of the freshwater crabs (Crustacea: Decapoda: Brachyura). J. Zool. Syst. Evol. Research 37: 19–38. Taylor, H. H., and E. W. Taylor. 1992. Gills and lungs: The exchange of gases and ions. Microscopic Anatomy of Invertebrates 10: 203–293. Wägele, J. W. 1989. On the influence of fishes on the evolution of benthic crustaceans. J. Zool. Syst. Evolut.-forsch. 27: 297–309. Woods, C. M. C. 1993. Natural diet of the crab Notomithrax ursus (Brachyura, Majidae) at Oaro, South Island, New Zealand. New Zealand Journal of Marine and Freshwater Research 27: 309–315.